Опис: Although present-day Ukraine has only been in existence for something over two decades, its recorded history reaches much further back for more than a thousand years to Kyivan Rus’. Over that time, it has usually been under control of invaders like the Turks and Tatars, or neighbors like Russia and Poland, and indeed it was part of the Soviet Union until it gained its independence in 1991. Today it is drawn between its huge neighbor to the east and the European Union, and is still struggling to choose its own path… although it remains uncertain of which way to turn. Nonetheless, as one of the largest European states, with considerable economic potential, it is not a place that can be readily overlooked. Ivan Katchanovski, Zenon E. Kohut, Bohdan Y. Nebesio, Myroslav Yurkevich. 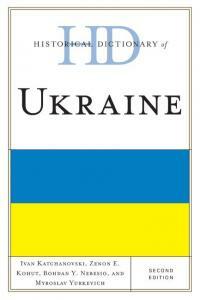 Historical Dictionary of Ukraine. Second edition. (Historical Dictionaries of Europe.) - Lanham-Toronto-Plymouth: The Scarecrow Press, 2013. - 914 pp.